Russian online retailers are expecting this year to be the one in which more Russians embrace the concept of online shopping. 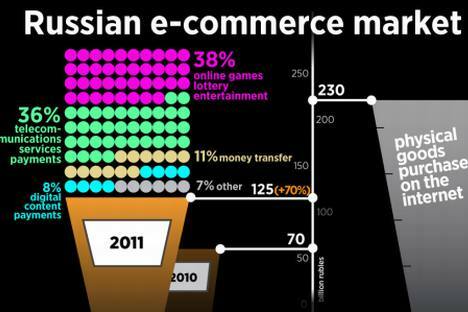 The Russian market for online shopping is both the youngest and most dynamic in Europe. It began to develop only four years ago, but by 2011 had outpaced France and Germany in terms of unique visitors. Russians are now embracing online shopping despite horror stories of fraud among early adapters. "We know that the time between when someone logs on for the first time on the Internet and when they make their first purchase is several years. We believe 2012 will become that year for a huge number of Russian Internet users. We expect explosive growth in the market," said Svetlana Sorokina, organizer of the Online Retail Russia Congress. This year alone more than 30 traditional brick-and-mortar stores plan to open online versions. According to Sorokina, the most anticipated opening of the year is the X5 Retail Group's online store. Representatives of online retailers estimated market turnover for goods purchased online in 2011 to be 270 billion rubles ($9 billion), up from 240 billion ($8 billion) in 2010). According to Pricewaterhouse Coopers (PwC), in the coming years, market volume for online purchase in Russia will more than double. Traditional retail growth in Russia is much slower: about 5-7% per year. But for the time being, the share of online sales as a percentage of total turnover of retail sales in Russia is negligible: 1.6%. This is much lower than in other major European countries; in the UK, for example, it is more than 10%. Only in Moscow, where the share of Web sales is around 20%, does volume approach the global average. More and more though, large retail chains operating in Russia recognize that online stores are a full-fledged opportunity for sales. For example, last year the share of online sales for the Euroset mobile phone retailer increased from 1.5% to almost 5%. For individual product groups, a company's share of sales over the Internet can reach up to 15%. Representatives of Euroset believe that over the course of five years, the share of Internet sales will reach 20%. M-Video, one of Russia's largest sellers of electronics and home appliances, reported that online sales in 2011 increased by 90%. The company expects that by 2015 online shopping will be responsible for up to a quarter of revenues. According to studies done by OZON, one of the largest online retailers in Russia, the most popular products on the RuNet are clothing (25%), electronics (15%), books (15%), cosmetics (13%), products for children (9%) and music and movies (8%). The rapidly growing Russian market has already begun to attract the attention of major international companies. Ebay, Amazon, and Alibaba have shown interest in the Russian market. Groupon Russia announced that it intends in the second half of the spring to launch an online store that will operate under the "discounter" format and feature "products ranging from household appliances and consumer electronics to clothing and shoes." At the moment, discount service Biglion.ru has this market segment almost to itself. During its first month of operation, Biglion sold 40,000 items, ranging from clothing and footwear to household appliances and electronics to tours.